Mike Hoffmeister gives us a guided tour of the Komatzu Zenoah plant in Japan! Mike wrote this article in May/June of 2002 for a print magazine, however the article was never published. You'll notice that many of the things referred to as future actions have already been done! We are very pleased to present this article to our readers! engine, and the impact that it has had on the growth of Gas Boating. On the other hand, most of us know very little about the company that is responsible for developing and producing some of the best R/C boat Gas engines available. Recently, I had the opportunity to spend a day at the Komatsu-Zenoah (KZ) factory in Japan. It was an amazing experience, which I will never forget! A tour of the assembly line. Before leaving the conference room, Mr. Takayoshi Shimazaki joined us. Although he has been with KZ only about one year, he has taken the lead role in designing the new parts for the G260PU series of engines, and has taken over most dyno testing responsibilities - and what a job he has done! When I saw the box of prototype hardware, which he started to unload onto the table, and the smile on his face, I knew we were in for some real fun! Mr. Kawazoe and Mr. Shimazaki were kind enough to allow me to photograph some of these parts, which are included below. My first observations were of the cleanliness and organized appearance of the facility, the friendliness of the people, and the true passion that they have for their work! Komatsu, the parent company, was founded in 1910, and today employs about 13,000 people. Komatsu's main products include construction equipment and machinery. Komatsu Zenoah is a subsidiary of the parent company, and employs about 800 people, working at two facilities. The KZ Head Office and Outdoor Power Equipment group (including Hobby Engines) is located in Kawagoe City. The Hobby Engine production line isvery modern, and utilizes a very efficient production line, using skilled labor , CNC and robotic equipment. Production capacity is 1500 units per day, or one engine coming off the assembly line about every 15 seconds!! The second facility, producing mainly hydraulic components, is located in Koriyama Japan. According to Mr. Kawazoe, KZ first entered the Hobby Engine market in 1990, when they developed the G2D70 for the German RC Car manufacturer, FG. In the early 90's, different versions of the G2D70 were released to help grow new markets for R/C airplanes, helicopters, and of course - boats. The first marine version was a water-cooled conversion that was done by B.H. Hanson. Robot picking up a connecting rod, with the big-end bearing and crank pin, on the way to the assembly press operation. Then in the mid 90's, KZ saw that the R/C markets were growing, and appeared to be ready for a new line of engines. KZ's philosophy was that if they release new and improved engines, that they would further accelerate expansion of these growing markets. Therefore, in 1996, KZ released the G230PU line of engines. The PU is the airplane version, the PUH for helicopters, and the PUM for marine use. According to KZ, the number one reason for the new PU series was to support the growing demands of the RC airplane market, but a close second priority was to release the PUM, which was the first production Gas marine engine from KZ. KZ wanted to offer a more "Customer Friendly" engine, which would not require aftermarket conversion to water-cooling. After the release of the PU series of engines in 1996, KZ saw demand increase and sales accelerate, proving the wisdom of their Marketing Strategy! Display board showing: day's production quota of 1100 units, The instantaneous target of 867 units, and The actual status of 873 units (slightly ahead of schedule!). of all Hobby Engine sales. KZ's answer to the SOLO was the G230RC, which was designed in 2000, and first produced in early 2001. Why talk about a car engine in a boat magazine? Well…the G230RC happens to be an outstanding boat engine too! 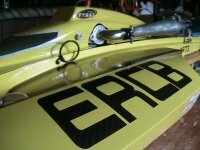 From the box-stock air-cooled version, to the various modified and water-cooled conversions offered by engine builders, the engine has been showing its strength in R/C boating in 2001. This experience has a lot to do with KZ's decision to develop an all-new PU series of engines, including a new marine engine - which will be covered a bit later. In the first year, KZ produced and sold about 20,000 G230RC units!! About 8000 of them were sold to support the target market for R/C use, and nearly 2000 for "other" applications, which include boats. These numbers met KZ's sales projections. What KZ did not expect was the huge popularity of this engine for Goped Racers. 10,000 of the 20,000 units sold were for the Goped market, which helped KZ to far exceed expectations for this engine - another success story, and an example of KZ being rewarded for their innovation! To further grow this market in 2001/2002, KZ has just released a new "Bore-Up" kit for the G230RC, which increases the bore from 32mm to 34mm. For the PU series engine, total sales have gradually increased from about 2000 units in 1996 (with less than 500 of them being the PUM marine engine), to over 5500 engines in 2001 (with nearly 2000 of them being the G230PUM marine engine). One of the biggest drivers of marine engine sales last year has been the rapid growth of the Ready-to-Run market, which is starting to favor the Zenoah engine. Although not their largest market, KZ is fully committed to supporting Gas Boating - and that is the subject of the next section! About 95% of all Hobby Engines are exported. Mr. Kawazoe has been with KZ throughout their history in the Hobby Engine market, and has led most of the marketing and development activities. He is a technical expert, an excellent Marketing Strategist, and a genuinely nice guy! Based on the huge success and outstanding performance of the G230RC engine, KZ set out to re-design their PU series of engines. The bottom-end (crankcase, crankshaft/rod, and ignition) will be relatively unchanged, however the 4-port cylinder design, which has been so successful with the G230RC, will be carried over to the new PU series of engines. KZ utilizes Pro/E 3-D CAM design tools, and they work closely with key suppliers and their own machine shop to make prototype parts. KZ also recognizes the insatiable desire for more cc's and more power, so they will be releasing the larger 34mm bore size as standard (resulting in a 25.4cc engine), however they will also supply a 22.5cc version initially, to monitor sales trends for both engines. As of this writing, KZ has two functioning prototype engines, both 25.4 cc versions. These utilize a billet crankcase set, which was fully CNC-machined on a multi-axis machine, and a custom cylinder casting (please see pictures). Development will be completed with the PU version (airplane version), and then an initial run of all PU models (including the PUM marine engine) will be produced in early June. KZ will then do extensive durability and performance testing, and around the end of June will also send a limited number of samples to some of their distributors for testing and evaluation. After this dyno and field-testing is completed, any small changes that are required will be incorporated into the final specification for the engine, and full production will start in late September. So far, dyno tests of the prototype G260PU airplane engine show a 26% increase in HP, and 17% increase in torque, compared to the current production G230PU airplane engine. Similar improvements will likely be achieved with the marine engine. The new G260PUM should mark a new era in affordable, out-of-the-box performance, and should also be a great engine to modify as well. Komatsu Zenoah has truly helped lead the way in the growth and development of Gas boating, and have proven themselves to produce dependable, durable, high-quality, reasonably priced products. I would like to conclude by again thanking Komatsu Zenoah, Mr. Kawazoe and Mr. Shimazaki for their hospitality, and most of all for their huge role in the growth of Gas RC Boating! Four main transfer ports, compared to only two for the previous G230PUM. Additional pictures from Mike Hoffmeister's visit to Komatsu-Zenoah! Well put Scott. I just hope a manufacture designs and builds a light weight forced induction four cycle before the "long as it's legal" expires. There would be designs problems to over come like what happens if you dunk one but it would be nice to see some creative engineering. Now 2 years after the fact of RCMK outright copying the basic platform taking the engine design and making it more refined and purpose built as a marine power house ... Zenoah has not even blinked or done squat ? Either those now owning the model faction of KZ ( Husqvarna ) have no interest in further R&D within the R/C model markets and are simply milking sales by just sticking with what proven until sales drop enough making it no longer profitable ? Or more likely knowing what has been talked about for YEARS now is 2 cycles as we know them are soon to be obsolete in this ever increasingly clean air and pollution free world ? RCMK may very well just be capitalizing on this "so long as it legal to market and promote small displacement 2 strokes" that we will see this evolution.